See the new 2017 Toyota Camry in Rochester, NH. The popular 2017 Toyota Camry has been America’s best selling passenger car for 14 consecutive years. This midsize sedan offers the best combination of roominess, comfort, quality, safety and performance in it’s segment. The new 2017 Toyota Camry marks the seventh design generation of the model and is packed with convenient features and style upgrades. 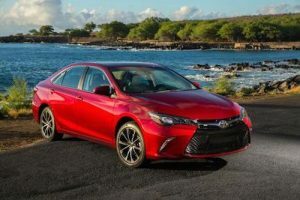 To satisfy the broad spectrum of midsize sedan customers, the new Toyota Camry is offered as the LX, XLE, SE and XSE model. New standard features found on the XLE and XSE models include a standard Entune Audio Plus multimedia system with Connected Navigation App & JBL Audio. The XLE, XSE four-cylinder and XLE Hybrid are now equipped with Qi Wireless Smartphone Charging for compatible phones. The new 2017 Camry is also offered with a new color choice, the bold Blue Streak Metallic, which was previously only available on the 2016 Camry Special Edition model. Powered by either a 2.5-liter four cylinder or 3.5-liter V6 engine mated with a six-speed automatic transmission, the Camry offers exceptional fuel economy. The four-cylinder model has an anticipated 24 MPG city / 33 MPG highway and the V6 model has an anticipated 21 MPG city / 30 MPG highway. For those who want far fewer trips to the pump, they 2017 Toyota Camry hybrid is expected to offer up to a 40 MPG combined rating. As a frequent recipient of the Insurance Institute for Highway Safety (IIHS) Top Safety Pick award, the Camry has been proven to be one of the safest vehicles on the road. The 2016 Toyota Camry received the prestigious IIHS Top Safety Pick+ rating when equipped with the Pre-Collision System that includes automatic emergency braking. A blind spot monitor with rear cross-traffic alert system is available on the XLE and XSE models and all new Camry models are equipped with an advanced airbag system that surrounds the front, side and rear interior areas of the vehicle. Our Rochester Toyota dealership offers a great selection of new Toyota Camrys to choose from, If you would like to learn more about America’s best selling passenger car, we invite you to stop by and test drive the 2017 Toyota Camry in Rochester, New Hampshire soon.